A local resource for luxury cars in Pleasanton since 1986, East Bay BMW joined Hendrick Automotive Group in 1992, and this partnership has helped us to offer professional and courteous service, advanced assistance, and the best products to drivers in Fremont, Blackhawk, Hayward, San Ramon, Danville, and beyond. It’s one of the reasons that East Bay BMW has received the BMW Center of Excellence Award multiple times over the years, and it’s why we frequently have shoppers traveling over 100 miles to buy their new or pre-owned vehicle with us. Customer service and satisfaction is our top priority, and–because we’re passionate about what we do and how we do it–the team at East Bay BMW makes it easy to come back time and again. Explore our website to get a taste of our range of services and products, or visit our Pleasanton BMW dealership to see why our passion is a prerequisite. While some genuinely enjoy the process of shopping around and visiting multiple dealerships to find new products, to compare [pre-owned vehicles, or to haggle over deals, that’s a use of time that’s simply not pragmatic for drivers who live life at full-pace. Fortunately, the team at East Bay BMW is committed to helping you find the right fit, close to home. Thanks to our Hendrick Auto connections, you can be confident in our ability to find your match. The new 2018-2019 BMW lineup is truly extraordinary, encompassing a wide range of options, body styles, performance types, and personalities, as seen in the coming soon, all-new 2018 BMW X2. Do you prefer something subtle and light on its feet? Or does a robust, powerful luxury SUV with an emphatic engine noise more suit your style? Browse options like the 2 Series, 3 Series, 5 Series, or 7 Series for sleek, suave, thrilling everyday performers, new BMW SAVs like the BMW X1, X3, and X5, or feed your adrenaline with a high-powered BMW M-Series performance car. Learn about the new BMW X2! BMW’s Certified Pre-Owned Program is one of the best on the market today, offering pre-driven vehicles – typically with low mileage and only one owner – at affordable prices, to make BMW luxury and comfort a feasible choice for more people than ever before. Hendrick Automotive boasts one of the most exceptional selections of quality pre-owned cars in the country, and Pleasanton’s East Bay BMW is no exception. Local drivers – and even some not-so-local drivers – choose our facility to help them find the pre-owned vehicle that’s right for their unique needs. Along with an exciting collection of pre-owned BMW cars in the Bay Area, you can find thousands of pre-owned vehicles online at Hendrick Cars. At our Pleasanton dealership, you have the power. No tricks, no gimmicks, and no underhanded tactics – just competitive pricing, fair rates, great Bay Area BMW lease deals, and experts who know the industry inside and out. While there are occasionally benefits to setting up your auto loan through a local bank or credit union, the benefits of working with us to learn all about your BMW financing options are numerous. You can apply online, value your trade-in, and work with a financial expert who’s truly invested in you. We’ll walk you through the process, and show you just how strong your buying power really is. While we certainly specialize in the BMW brand and its unique products, our team of expert technicians and parts professionals offer their services to a full range of makes and models, from today and yesteryear. Because if there’s anything that we’re more passionate about than BMW, it’s making our clients happy and helping them to love their vehicle. One of the best investments that you can make if you own a BMW is quality maintenance. German engineering is known far and wide for being the best in the world – but high-tech engineering and clear-cut precision parts require more than just a casual understanding of automobiles. Our BMW service center offers the benefit of working with highly-trained technicians with deep comprehension of – and appreciation for – these intense and complicated vehicles. Looking for the ultimate convenience? You can now schedule service appointments online any time of the day or night, from the comfort of your home, office, or even your smartphone. 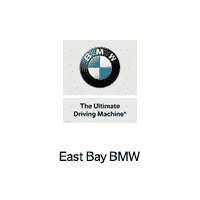 At East Bay BMW, we are truly passionate about the models that we sell, the cars that we drive, and the services that we offer. So it would make sense that we’re equally as passionate about the products that we use in our repairs, and those that we offer for sale to local BMW drivers: that’s why we stock our shelves with genuine BMW parts and only the highest quality accessories for your vehicle. Feel free to explore our website from your desktop, tablet, laptop, or smartphone–get a feel for our products and what we can offer to you, or learn more about us here. We look forward to serving customers from Pleasanton, Fremont, Blackhawk, Hayward, San Ramon, and Danville.